the hole. Has anybody used a diesel/kerosene heater like this? I know this is an obvious question, but is there a lot of exhaust smell from this? Your experiences and suggestions would be appreciated. The October 2001 issue of Cruising World has done a very complete article on Cabin Heaters. Sizes, fuels, prices, BTU, advantages and disadvantages. Well worth the read. The flue cap generally has much to do with the odors. 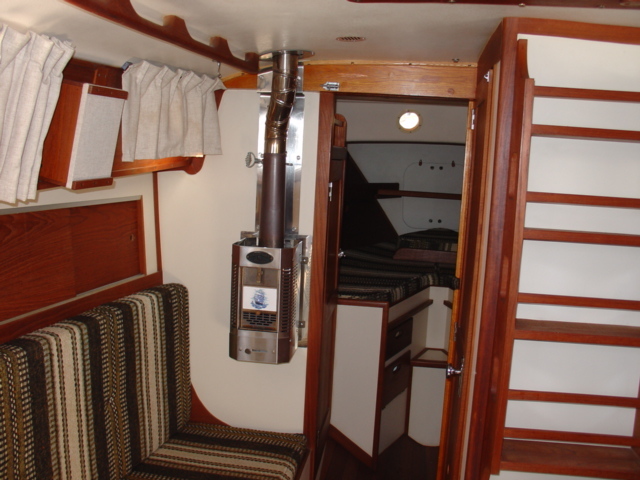 They should have fresh air inlets rather than depend upon the cabin's air supply and the flue cap should be baffled to prevent the blowback from wind across the deck. 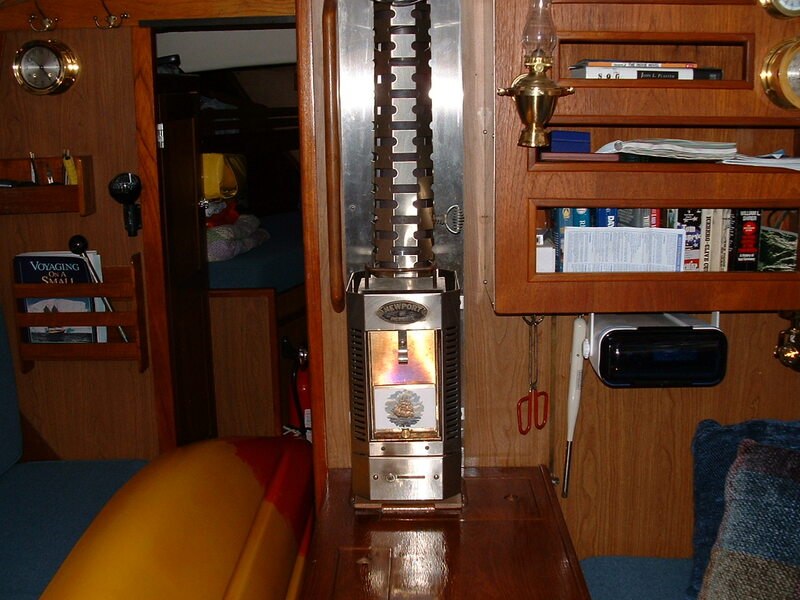 I had the Force 10 kerosine heater on my last boat (35 foot wooden Cheoy Lee Lion). A wonderful comfort when the temps fell! Be sure you use a fan to direct the heat. I had best results with the fan aimed at the heater itself. It is externally vented, so the smell isn't bad. There is, though, a definite kero-burning smell. I like that but some hate it. It used about a gallon of fuel a day. Like all kero appliances, it's a pain to use. Prime with alcohol, pressurize the tank, etc, etc. Get it wrong and black smoke is everywhere. Even in the best of times there's some blackening of the overhead as well. The burners need occasional rebuilds. I used this on two transatlantics up at 50 north. Quite a help. And pumping up the tank with the bicycle pump warmed me up as well! However, if doing it again, I'd look into propane. It's so much easier to use. I do not know, though, how much fuel the propane version uses. Most of you, I am sure, are not concerned with cabin heat, but Daybreak is now in the Pacific Northwest with Glacier Bay and other points north in her future. ?Lauri and I have been pondering the roster of devices available to take the chill off and dispel moisture. ?All have their advantages and disadvantages ranging from cost for an Airtronics D-4 forced air unit to space requirements for various diesel and propane fired space heaters. ?I would be interested to hear about any self contained heating systems that may be in use in the Seawind II fleet. ? Presto type logs. Clean burning and keeps the cabin toasty warm. On a trip up north to Alaska it would be very easy to pick up an endless supply of small pieces of driftwood on shore. What I don't care for is smoke in the cabin almost every time you open the door to add more fuel. I have considered removing it and replacing it with a diesel heater but thats a project (low priority) for another day. I have attached a photo so you can see the location.